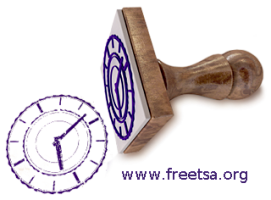 freeTSA.org provides a free Time Stamp Authority. Adding a trusted timestamp to code or to an electronic signature provides a digital seal of data integrity and a trusted date and time of when the transaction took place. Trusted timestamping is the process of securely keeping track of the creation and modification times of a document. Security here means that no one - not even the owner of the document - should be able to change it once it has been recorded provided that the timestamper's integrity is never compromised. FreeTSA trusted timestamping Software as a Service (SaaS) provides an easy method to apply RFC 3161 trusted timestamps to time-sensitive transactions through independently verified and auditable date and UTC (Coordinated Universal Time) sources. Adding a trusted timestamp to code or to an electronic signature provides a digital seal of data integrity and a trusted date and time of when the transaction took place. Recipients of documents and code with a trusted timestamp can verify when the document or code was digitally or electronically signed, as well as verify that the document or code was not altered after the date the timestamp vouches for. (Readme). For multiple files, the general concept is that timestamping a single file that contains an aggregate list of fingerprints of other files, also proves that these other files must have existed before the aggregate file was created, provided that both the aggregate file and the referenced file are available during verification process. Freetsa also offers the possibility of URLs timestamps (do not abuse). If you are interested in implementing timestamps on your project / company using the FreeTSA service, you can contact me for specific requirements. Freetsa can also be used within the Tor anonymity network. Making timestamps from Android/iOS devices is possible and no software installation is required (Video). To timestamp a picture you must go to the "Online Signature" section in the browser, click "Choose a file" and select "Use camera". Once the photo or video are completed, you can download the timestamp (TImeStampResponse). Just that. You also may select any other file available in the device if you choose so. Freetsa.org offers free NTP and DNSCRYPT services for time synchronisation and encrypted name resolution respectively. The resolution of DNS (Port 553) do not have any type of restriction (SPAM, Malware, Parental,...). No logs are saved and the keys-rotation is every 12 hours. Create a tsq (TimeStampQuery) file, which contains a hash of the file you want to sign. Send the TimeStampQuery to freeTSA.org and receive a tsr (TimeStampRequest) file. With the public Certificates you can verify the TimeStampRequest. The file never leave your browser. Download the TimeSpamtQuery or Response. Please select a tsq and a tsr file. Error: Did you have select a tsq and a tsr file? illegal Internet content / non-repudiation of certain content. Deleted / Edited controversial news. Slander, threats or insults on Internet (social networks) / Scams. Misuse of intellectual property: articles, photographs, plagiarism, etc. Simply demonstrate the existence of a specific content at a specific time. Web content and links in PDF / PNG format (attachment) + Signature with Timestamping (SHA-512). Aprox wait time 25 secons.